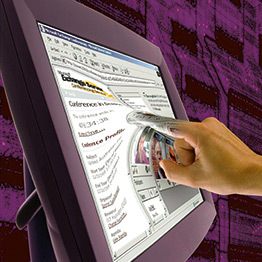 Our strat-fx™ branded products are designed to meet a variety of requirements, from use in dry-erase whiteboards to touchscreens for smartphones, tablets, and industrial and consumer electronic displays. Our optically clear adhesive film is a free-standing, pressure sensitive, bonding film designed specifically for laminating both smooth and rough substrates. Learn more about our strat-fx™ branded line of products. Dry erase film coating is ideal for whiteboards, calendars, strategy boards, and more. One side is coated with 35gu hardcoat, and the second side may be coated with a pressure sensitive adhesive. This film coating eliminates ‘hot spots’ from projectors during presentations, produces superior writeability and erasability, has anti-graffiti capabilities, is chemical resistant, displays brilliant white tones when compared to other whiteboards surfaces, and creates visual uniformity with a consistent matte finish that is free of optical imperfections. Our optical clear adhesive films are custom designed to OEM/end-user requirements and can be manufactured in thickness from 1mil to 7mils, a wide range of coated and slit widths, and can be custom formulated to achieve specific properties. These films are used in capacitive touch screens, rear projection screens, graphic overlays, and other applications where adhesion and optical clarity are crucial. Coated Nylon 6.6 barrier film, also known as B 602A DARTEK®, is a strong, transparent film. It has a PVDC coating applied to one side for an enhanced barrier to oxygen, moisture, grease, or odor. It can be used for any packaging or industrial end-use requiring high barrier properties. It features a high oxygen gas barrier and water vapor transfer rate (WVTR) barrier and is grease and high-heat resistant. At TC Transcontinental, our products are manufactured in ISO-certified facilities in the USA and UK. With a full staff of chemists, engineers, and analytic professionals to assist in the development and refinement of your custom adhesive product, we can take your idea from start to supply, acting as your advisors to achieve your business goals. If you’re interested in working with us to develop a strat-fx™ branded product for your business, then fill out our online inquiry. One of our colleagues will be happy to assist you.